Hillary Nzioka Mutyambai has this morning been sworn in as the country’s third Police Inspector General (IG). Mutyambai who replaces Joseph Boinnet will serve a four-year term as the new IG, as mandated in the 2010 Kenyan Constitution. The third Inspector General Hillary Mutyambai has promised to take on the police reforms that were put in place by his predecessor. Mr. Mutyambai has assured the police officers that during his four-year tenure, he will ensure the construction and operation of the National Police Service Referral Hospital. The construction of the police hospital is what the outgoing IG Joseph Boinnet noted as one of his ‘failure’ during his term. “One thing I am not happy leaving undone is the matter of building a national police hospital,” said Boinnet. The event took place at the Supreme Court presided over by Judiciary’s Chief Registrar Anne Amadi, in the presence of CJ David Maraga. 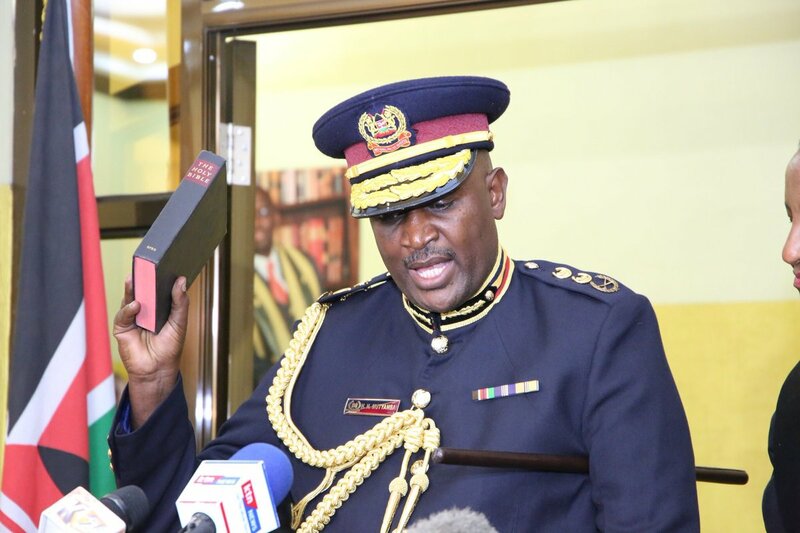 The post Promises as new IG Hilary Mutyambai takes oath appeared first on Kenya Today.